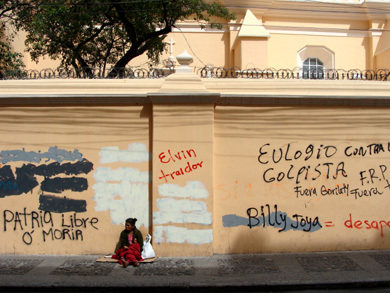 “When the media goes quiet, the walls speak.” — graffiti in Tegucigalpa. What strikes a visitor to the Honduran capital most immediately in this moment is the degree to which the social and political conflict that has erupted since the golpe de estado (coup d’etat) on June 28th is actually written on the walls, the fences, the rockfaces, bridges, errant bits of siding, abandoned buildings, and even the concrete upon which one walks. Though the discourse in the international press is muddled and misinformed, the situation in Honduras is very obvious to those who are here – as a quick taxi ride around Tegucigalpa demonstrates. Honduras has been long dominated by a handful of some ten to fifteen wealthy families. Everyone here knows their names – Facusse, Ferrari, Micheletti – and now they are scrawled on walls everywhere, next to accusations of golpista (coup-supporter) and asesino (assassin). These oligarchs used to be satisfied by controlling the economy and buying off the politicians, but they now increasingly insist upon exercising direct political control themselves, and their names show up more and more in congress, in the supreme court and now even in the executive branch. It is in that context that an event that fit perfectly the definition of a coup is being recast by the Honduran elite, and its foreign allies, as a constitutional transfer of power. Never mind that the democratically elected President was abducted from his home and flown out of the country in his pyjamas on the morning of a non-binding referendum on re-opening the constitution to reform. Never mind that the movement to reform the constitution was driven by a social movement that wanted to re-found the country along more equitable lines, breaking the decades of uncontested dominance by the few over the many. Never mind that President Manuel Zelaya’s only transgression was that he was appealing directly to the people, in defiance of a congress and supreme court that was subservient to the oligarchy and would never consent to reforming a constitution that was written to serve their interests. These details – say the golpistas – are not important. Instead, they spin a tale in which Zelaya was a minion of Venezuela’s President Hugo Chávez (who according to this discourse is inherently bad) and claim that Zelaya intended to change the constitution to make himself president-for-life. In order to preserve democracy, the story says, the congress and supreme court proceeded with a legal process to remove the elected president and replace him until new elections could be held. This story has been taken up by the international press, despite its being patently untrue, and repeated ad nauseam in the hopes of giving legitimacy to a process that seeks to re-entrench an oligarchy feeling its power threatened for the first time in decades. The central issue at stake in Honduras today – and the spark for the oligarchy’s risky decision to carry out the coup in June – is the increasingly adamant insistence on the part of Honduran social movements for a constituyente, the striking of an assembly to re-write the constitution. It was, indeed, this very question that was to be put to a non-binding referendum on the morning of the coup and it was expected that the people would support the idea overwhelmingly. Like many of its Central and South American neighbours, Honduras’ principle legal code was written during a period dominated by U.S. Cold War imperialism and local comprador quasi-fascists. The legacy of the Operation Condor/School of the Americas era was, among so many other tragedies, legal and political structures that ensured the continued dominance of the elite few and Honduras was a perfect case study. In fact, the current constitution of Honduras was ratified in 1982, during the period in which it earned the nickname ‘U.S.S. Honduras.’ The most successful resistance group in Honduras in the 1970s was called the National Federation of Honduras Peasants (FENACH) and wasn’t able to muster the kind of strength that the Sandinistas in Nicaragua built, nor even to achieve the limited level of challenge of the guerillas in Guatemala or El Salvador. As a result, Honduras became the perfect base for U.S. operations in Central America, and indeed the Contra Wars against Nicaragua were waged from the U.S. military base at Palmerola, just outside of Tegucigalpa, among countless other interventions and terror campaigns in the region. In addition to the 18 military bases it established and the 10,000 American troops stationed there, the U.S. also provided the Honduran armed forces with over $100-million between 1980-84. This infusion of money and technical support to the military and business elite reinforced the strength of the oligarchy in Tegucigalpa and led to dramatic increases in poverty, inequality and political repression. The 1982 constitution was written after decades of military dictatorship while Honduras was playing host to a U.S.-led paramilitary contra force of over 15,000 soldiers trained in what we now call ‘counter-insurgency’ – specializing in campaigns of terror against primarily poor and ill-equipped guerilla forces and their supporters. During that period, according to Joan Kruckewitt, “the use of repression, instead of concessions and reform, became the norm” and that “the military emerged from the period of U.S.-led militarization as the most powerful sector in the country, with few checks and balances to restrain them.”1 Indeed, between 1981-84, while the new constitution was being written, ratified and established into political order, the military carried out 214 political assassinations, 110 ‘disappearances,’ and 1,947 illegal detentions. Given that context, calling the 1982 constitution ‘representative’ of any but the most elite strata of Honduran society would be patently absurd; the vast majority of people in the country were living in abject poverty and ceaseless fear of their own soldiers and police. But as the political climate in Latin America has shifted, and as new openings for emancipatory projects have emerged, Hondurans have become increasingly insistent on the need to re-establish the country on their own terms. 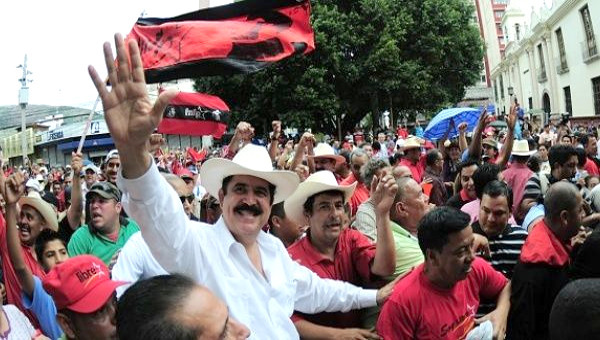 Social movements centered around trade-unions, human rights and campesino groups increasingly drew people from a wide variety of Honduran civil society into a broad movement for significant reform, and had their greatest successes between 2005-2008 under President Manuel “Mel” Zelaya. Perhaps the most interesting thing about June 28th was the way that it created Mel Zelaya as a popular figure in Honduras. He was elected President in 2005 as a member of the Liberal Party, one of the two primary parties, neither known for any history of radicalism. Zelaya’s own background was as a junior-member of the oligarchy, a wealthy rancher from the south, and his long political career had never shown any signs of divergence from the standard conservatism of Honduran politics. In fact, the only thing that separated Zelaya from someone like Roberto Micheletti – the tremendously unpopular figure who emerged as de facto President after the coup – was that he recognized the growing popularity of the movements for social reform. His decisions to raise the minimum wage, to declare a moratorium on foreign mining concessions and to veto a law banning birth-control pills were not simply manifestations of his own radical spirit, no matter how noble his intentions may have been. No, Zelaya executed in a calculating way – through undeniably positive – political decisions that kept him palatable to the people on whom his support relied. Indeed, he relied on that support increasingly after his support for the constituent assembly broke him from his allies in the Liberal Party. 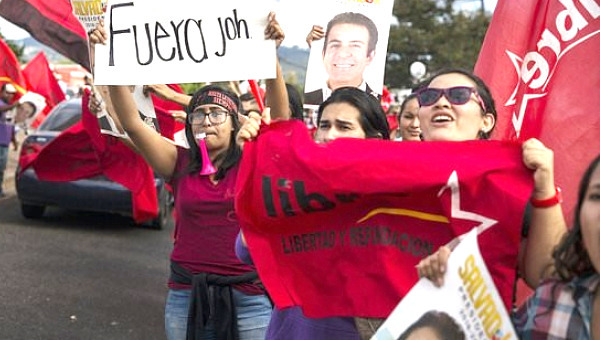 But Zelaya before June 28th was simply a means to an end for the social movements in Honduras – a politician who had proven to be malleable to demonstrations of popular politics. His endorsement of the constituyente was the most important move he made and, in fact, he conducted the process with due diligence to the existing constitution and, despite its being repeated in every AP news bulletin since the coup, it never contained even the possibility of giving Zelaya another term in office. The process was to be as follows: on June 28th, Hondurans would vote in a non-binding referendum on whether they supported the addition of a fourth ballot in the general elections scheduled for Nov. 29th. Normally, Honduran elections feature three ballots, corresponding to each of the three levels of government. If the referendum came back with a strong ‘yes,’ Zelaya would have added the fourth ballot asking the question “do you support the creation of a national constituent assembly to re-draft the constitution?” Accordingly, the constitution could not have possibly been changed before the Nov. 29th elections, and so Zelaya could not have possibly stood for re-election. Furthermore, the primaries for that election had already taken place and, again, Zelaya’s name was not put forward – even had he wanted to, it was illegal. The notion that Zelaya intended to manipulate the process to stay in power is patently absurd. But the Honduran Congress, packed with members of the oligarchy, felt that the re-opening of the constitution could represent a real threat to their stranglehold on power and refused to accept the idea. Zelaya, in response, appealed directly to the people – implicitly rejecting the legitimacy of the Honduran form of representative democracy that had brought him to power in the first place – and vowed to pursue the constituyente if the people asked for it. Of course, that process never went ahead, because the morning that the first non-binding poll was supposed to happen, Zelaya was abducted by the military and flown to Costa Rica. Roberto Micheletti was sworn in as de facto President, and the referendum was cancelled. Dramatic footage from that morning showed people in the early hours of the day, coming out to vote and finding the military in the streets – outrage turned to despair which, in turn, was channeled into absolute determination to resist this transparently coercive undermining of popular will. Demonstrations erupted in the immediate aftermath of the coup, and the golpista regime expected them to last for only a few days. Unlike Zelaya, they underestimated the strength and commitment of the Honduran movement for reform. “I’m proud that Hondurans are usually so peaceful, but I’m even more proud that we’re finally standing up for ourselves.” – Rosa Mayda Martinez, office worker, Jutiapa. What followed was the largest sustained demonstration in Central American history. 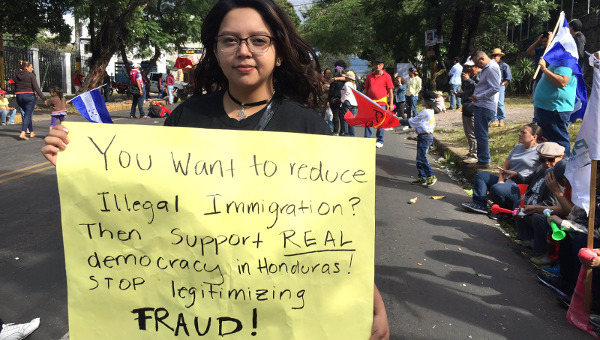 For 156 straight days, Hondurans took to the streets of Tegucigalpa. The numbers fluctuated from as high as hundreds of thousands to the still impressive thousands that were protesting right up to the day of the ‘elections’ on Nov. 29th. Predictably, they met widespread and violent repression. Between June and November, 33 people were killed in political violence and hundreds more were detained, beaten, kidnapped, raped and otherwise victimized by an increasingly militarized state apparatus. In September, President Zelaya returned to the country and took refuge in the Brazilian embassy, where he still remains, guarded by police who are under orders to arrest him the moment he leaves Brazilian territory. 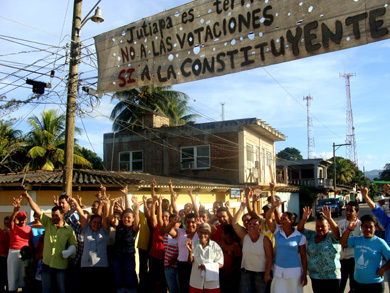 Nov. 29, 2009 – In the southern town of Jutiapa, the community has refused to be intimidated by the military and police. Despite kidnappings and detentions, beating and death threats, and a ceaseless campaign of terror, they hang a banner on the main road through town declaring themselves against the coup and the elections. They pose for a photo, cheering beneath their banner, knowing that police are stationed just a few blocks away. There is much more to be said about the nature of the resistance than space here permits. For the time being, it will have to suffice to say that the coup produced the unintended consequence of uniting an otherwise fragmented group of organizations into a broad coalition – the Frente Popular Nacional de Resistencia (National Popular Resistance Front) – which has become the most important popular organization in Honduras. Its members come primarily from the poorest classes – workers and campesinos – but are also drawn from the relatively small ‘middle’ classes, including teachers, lawyers, doctors, left-liberal politicians and civil servants etc. They have worked closely with local human rights organizations and some foreign NGOs, but they have maintained absolute autonomy from foreign interlocutors (whatever their intentions) in defiance of the characterization of the Frente as a Chávez-exported ring of professional troublemakers and socialists. The demonstrations have not been limited to Tegucigalpa. The second largest city in Honduras, San Pedro Sula, is a major industrial center and is the epicenter of foreign-owned Honduran maquiladora-style production. Protests have erupted there regularly, including one on the day of the Nov. 29th ‘elections.’ It was repressed with tear gas and rubber bullets injuring dozens of people, including a Reuters photographer from Brazil. Furthermore, rural Hondurans have been active in the resistance, blocking highways, distributing information and protesting outside government offices. Only a few areas of Honduras have not seen major movements against the coup – primarily Roatan and the Bay Islands, a ring of tropical island destinations off the north coast, dotted with, and politically controlled by, foreign-owned resort hotels (many of them Canadian). The foreign and local elite who have turned the islands, and most of their inhabitants, into tools for their personal profit have been the most vocally supportive of the coup. They pump out misleading or, at best, willfully ignorant anti-Zelaya rants everywhere they can, notably on internet news sites; my own reports have been consistently attacked and, in one instance, they even went as far as to threaten my life. These attacks are most likely motivated by the insistence of the social movements for tax reforms that would bring a share of their profits back to the state for the purposes of re-distribution through increased support for education, housing, health care and other social programs. Foreign-owned companies currently operate in an almost-entirely tax free environment, one of the many grievances that the proponents of the constituyente were hoping to redress. “In my case, I am known by the police, they can do anything to me. I thought about moving to a new house with comrades, do you think this is a good idea?” – Rosner Giovanni Reyes, member of Resistance, in a meeting with COFADEH representatives, Nov. 28th, 2009. They go on to note that holding elections under these circumstances is absurd, given that the same people who are committing this violence are those who are supposed to be responsible for running fair elections. They also note some of the most high-profile cases of repression. Carlos H. Reyes, a member of the social movements and initially an independent Presidential candidate, was hospitalized after a brutal blow from police in a peaceful demonstration. Ulises Sarmiento, a well-known member of the Liberal Party who sympathized with the resistance had his home ransacked by soldiers with automatic weapons in the province of Olancho. Eliseo Hernandez Juarez, a vice-mayoral candidate, was assassinated. Not surprisingly, the violence has not been limited to high-profile politicians. Victor Corrales Mejia and his son, members of the resistance, were arrested the night before the elections and beaten in their home. Police came to their home, hit Victor in the head and spine with batons and threatened to kill him. “They kicked in my door, they threw me out like I was a sack of corn, they want to intimidate us,” he told me. “But our desire for democracy is stronger than they are.” In Comayagua, where the resistance is strong and led by teachers, campesinos and women’s and indigenous rights activists, the Mayor threatened to give the names and addresses of anyone who interfered with the election to the military. In fact, the military sent a letter a month before the elections demanding such lists from all the Mayors across the country. Meanwhile, state henchmen shot Alejandro Villatoro, the owner of Radio Globo – one of the few media outlets brave enough to speak out against the coup – and stole the computer from which the station was broadcasting. “No to the coup regime elections! Free men and women of Honduras, they want to use your vote to legalize the coup. Each vote is a blow to your freedom.” – Resistencia poster. Given the context described above, it is hard to imagine how anyone could seriously claim that ‘the event’ on Nov. 29th could be called a free or fair election. On the day of the vote, the Frente urged Hondurans to stay home and boycott la farsa (farce). And that is precisely what happened – on a day that is normally a boisterous street party filled with red or blue flags representing to the two primary political parties, Honduras was quiet and subdued. Most polling stations had more military and police than civilians. The TSE itself admitted that only around 1.7 million people voted, in a country of nearly 8 million, with 4.6 million eligible to vote. That makes a turnout of around 35%, the lowest since the end of military dictatorships in the early 80s. Inexplicably, on the night of Nov. 29th, the TSE announced a projected turnout of 60%, which became the number repeated in almost every international news source. Fox News in the United States was one of the few exceptions, reporting the absurd figure of 70% – no one has yet been able to explain where that number came from. They further asserted that they saw “no voter intimidation by any group, individual, or party” and that their observations “coincide with those reported by other observers and by the media throughout Honduras.” Nonetheless, when I asked Edward Fox about those other observers, the groups who have been documenting the violence and terror, he admitted that he had not spoken to any of them. Avoiding them must have taken some effort, because when those groups presented their report to the TSE on Nov. 28th, the U.S. observers were there; in fact, the human rights delegation had their meeting scheduled for 2:00 p.m. but had to wait until well after 4:00 p.m. because TSE officials were meeting with the U.S. observers. We were all there together, and at one point I overheard the U.S. observers chatting amongst themselves derisively about the human rights group and about Honduras in general. “Where are the people? The people are in the streets, struggling for their freedom!” – Resistencia chant. Much more needs to be said about Canada’s relationship to Honduras and the golpistas. A petition, calling for non-recognition of the elections is circulating and has garnered nearly 400 names – a small step toward building public awareness of Canada’s complicity in this desecration of democracy and human rights. Tyler Shipley did research and human rights observation in Tegucigalpa with a delegation organized by Rights Action, reporting on the resistance to the coup and the Nov. 29 elections. The entire photo essay “Honduras Police State – A Week In Pictures” is at available at toronto.mediacoop.ca. Joan Kruckewitt, “U.S. Militarization of Honduras in the 1980s and the Creation of CIA-backed Death Squads,” in Cecilia Mejivar and Nestor Rodriguez, When States Kill: Latin America, the U.S., and Technologies of Terror , University of Texas Press, Austin, TX, 2005. Official Statement by representatives of CODEH, COFADEH, FIAN, CDM, CPTRT, CIPRODEH to the TSE, Nov. 28, 2009. Translated from Spanish. Statement on the National Elections in Honduras, Washington Senior Observer Group, December 1, 2009. Peter Kent, “Canada Congratulates Honduran People on Elections,” December 1, 2009. Tyler Shipley is professor of Culture, Society, and Commerce at the Humber Institute of Technology and Advanced Learning and he has written for academic journals and local and mainstream media across North America and Europe. 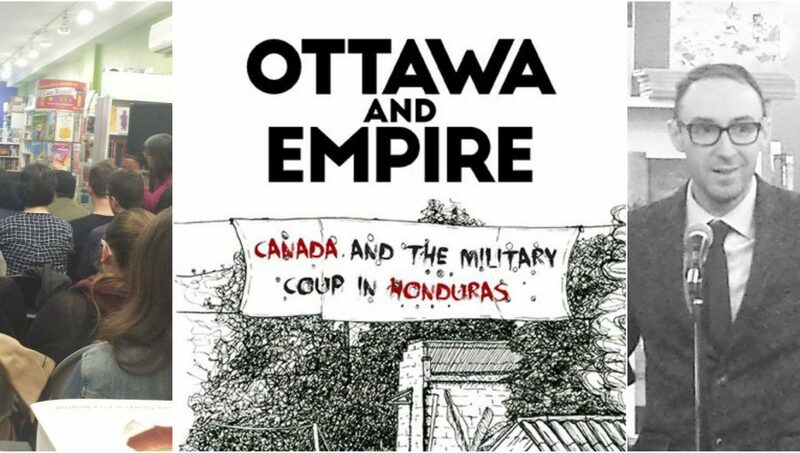 His recent book is Ottawa and Empire: Canada and the Military Coup in Honduras . He is the editor of Left Hook journal .